Even though Pongo's Buy/Sell/Trade thread (link given later) has doubled as his defacto Review thread for over four years now, I was surprised to see that no one had done a review here in the main Review thread... so here's my review of Pongo's vinyl decals. I'll warn you right up front, I tend toward the verbose, but I'll try to keep the word count down. Due to a friend moving to Oregon, I now find myself in possession of two gutted cabinets without control panels, so it's New Project Time. Tax money comes in, and goes right out to Ultimarc for 18 white UltraLux pushbuttons with RGB LEDs and a PacLED64 to light 'em up. I'm going with Admin buttons this time around, so I want some kind of insert to sit atop the button diffusers to clearly show the function of each admin button. I consider printing out my own on transparency paper, but with some good advice from Markronz, it seems it will be quite a pain to get the 18 inserts cut out just right, so I decide against it. Fast-forward through a little more Forum searching, and I find Pongo's B/S/T thread. Per the instructions in his B/S/T thread, I contact him via private message. 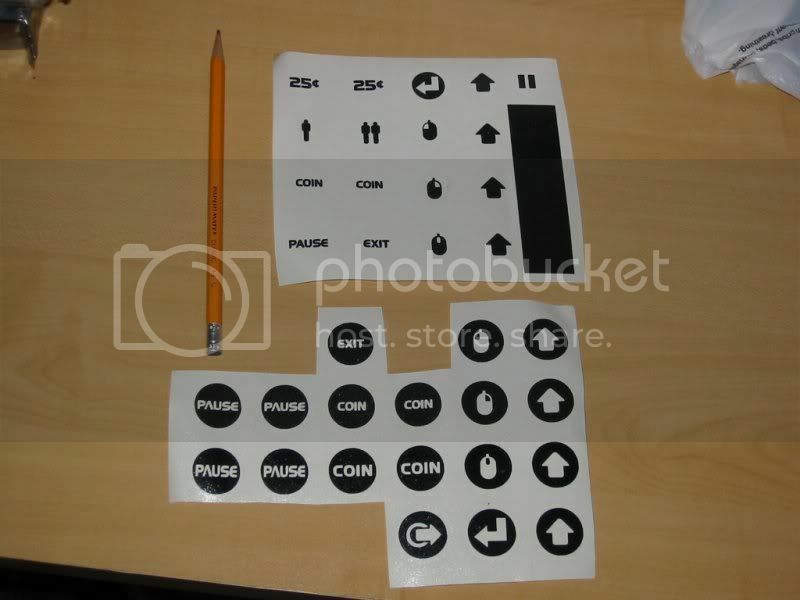 In the PM I describe what I want - a set of reverse-print (circular black vinyl with the graphics cut out in the middle) pushbutton decals, sized specifically to fit Ultralux diffusers. I stress right away that if the decal is even slightly too small, it's going to look very cheesy, and if it's even slightly too big, it simply won't work at all. Pongo gets back to me, tells me this is no problem, we'll confirm the sizing with the proof sheet. I give him the diameter of the diffuser (21mm, or roughly 13/16"), describe the graphics I want, and I soon receive a proof sheet by email. I must point out that this is the point I knew I was going to do business with Pongo, because not only did the graphics look great, not only did it contain all the graphics we discussed, and several different slight variations of each one, but he provided these custom graphics in full-resolution, and actually went so far as to say that if I decide not to place an order, I can still go ahead and use these graphics, and I wouldn't owe him anything. That, my friends, is Class. He doesn't assume the worst in people and overlay his proof sheet with the word DRAFT in big, bold letters all over the place... he goes into the transaction assuming you will conduct yourself with integrity, and he does the same. So, the graphics look great, a test print shows that he got the sizing dead-on balls accurate, so I place the order. The decal itself is, in my case, pitch black and completely opaque. It has a good feel to it, very smooth. 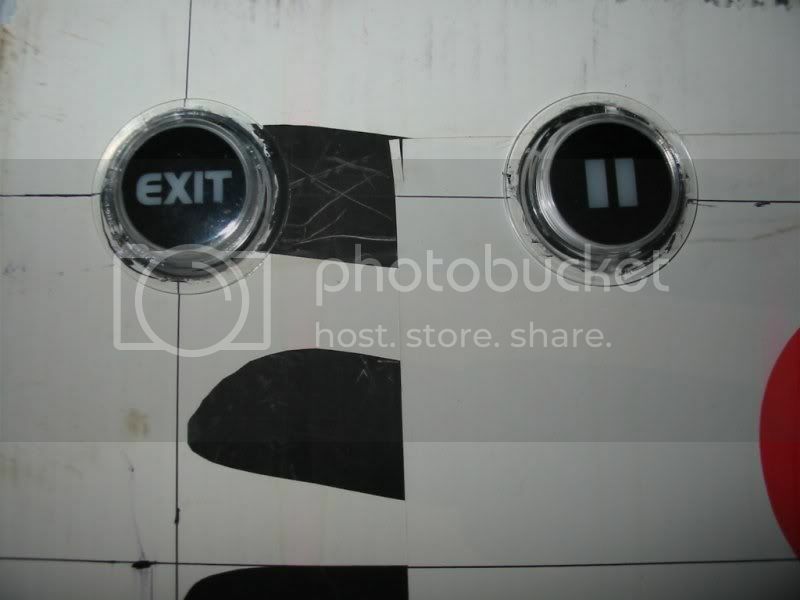 I cannot speak to how it feels during game play, because in my case, the decal is locked inside the pushbutton itself. I don't know how common this method is, as I have never worked with vinyl decals before, but the way these sheets are set up is genius... The vinyl decal is sandwiched between a sheet of white wax paper and a sheet of clear plastic. And although the sticky side of the decal is stuck to the wax paper, the clear plastic sheet is similarly stuck to the front of the decal...how, I do not know. What this allows you to do is cut out your decal, peel off the wax paper backing, line up the decal on the target surface (in my case, a round plastic diffuser that is almost exactly the same size as the decal), press it into place, and peel off the clear plastic sheet. What you are left with is a perfectly placed vinyl decal. In case you are wondering, the clear plastic top sheet leaves no residue behind on the decal, once peeled. I can also report that in one instance, after sticking one decal badly off-center, I was able to peel the entire decal off intact and re-stick it, with no apparent damage or stretching to the decal. I'll let the pictures do the talking and you can draw your own conclusions. For my part, I couldn't be happier with the way they turned out. The one thing I will say is, try to not be distracted by the horrendously hideous corregated plastic monstrosity that these buttons are mounted in... this is my control panel test rig, made from an old scavenged outdoor sign from my wife's party supply store. Just keep your eyes on the decals, people. A couple Admin buttons, installed, lit, in a bright room. A couple Admin buttons, installed, lit, in a dark room. As I said, I couldn't be happier with the way they turned out. Keep in mind that Pongo does this on the side, and most of what he does is custom for each order, so just don't expect a lightning-fast transaction here. If you're wondering about the price, I'll tell you it was more than reasonable to me, and I'll direct you to Pongo beyond that. See the first post in the thread for instructions on how to engage Pongo and get the ball rolling, and skim through the rest of the posts for instructions, examples, and proof sheets. Absolutely +1. Product, shipping, communication all top notch. Can't wait to put them on my buttons (unlit black concave buttons receiving white vinyl) maybe even this weekend. Remember the cnc vinyl cutter does the outlines but I'm pretty sure all the negative space vinyl is removed by hand. I've heard it called weeding. If I was Pongo I would just give some nice instructions on how to do it yourself! That is real value being provided because it's easy to mess up and spear your positive with the exacto. 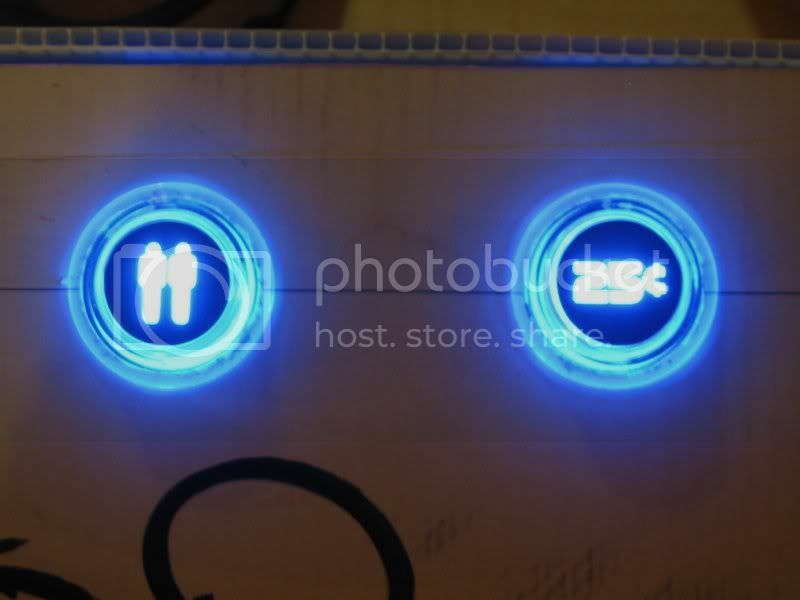 By any chance have you seen the blue ultralux button done the same way with a white LED? Do you think the results would be the same? Definitely a great product and service. Glad to hear that his custom work is as good as his standard line. I ordered a couple of his standard sheets in white and couldn't be happier. Fast shipping too. Very easy to apply to buttons. And the white looks great on a black button, TopJimmyC. The illuminated buttons look really good. I may have to figure out how to re-do my own control panel now! ...I'm pretty sure all the negative space vinyl is removed by hand. I've heard it called weeding. Yup, this is exactly what happens. Each set takes me around 20 minutes of picking out all the negative space. Even with all the practice I get, there are still problems with this part. These pieces are so small they lift up easily during this phase. I've gotten pretty good at pulling them apart though,... when I first started it was closer to 35 minutes for a set. 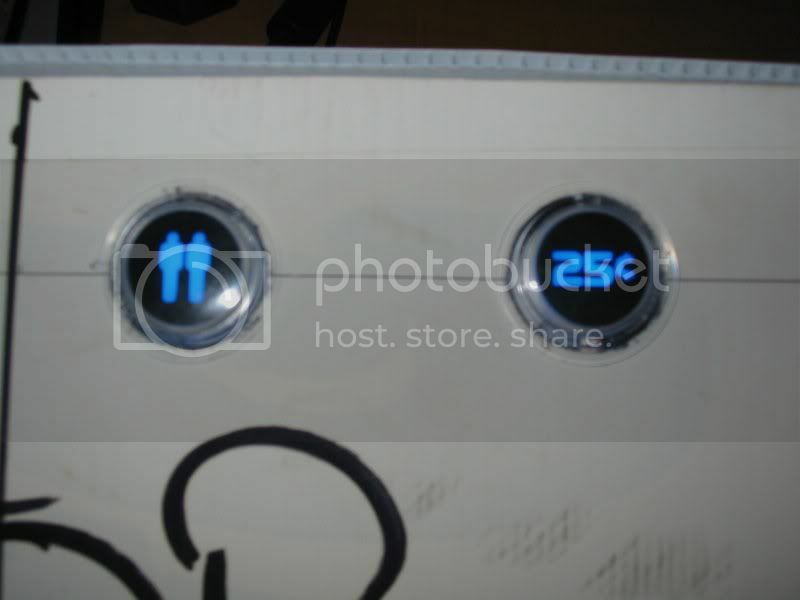 Just got a set of these for my cab. EveGames your buttons look so good I have to rip you off. Thanks for "paving the way" guys! I totally agree here. Pongo was a pleasure to deal with, his prices are fair, and his product/craftsmanship were top quality. Cant wait to order from him again when I build another cabinet. When I first applied the vinyl I was worried that it might eventually lose its adhesiveness and peel off of the buttons after much use, but I am proud to announce that after countless gaming sessions with many people the decals look as good as the day I applied them. My attempt at doing these buttons can be found here: http://forum.arcadecontrols.com/index.php?topic=110471.40 in reply #74. Preliminary results as I am still waiting for artwork before moving forward on my project.